Three graduate students in the Department of Aerospace Engineering were recently awarded fellowships. Elaine Petro and Nathan Shumway were awarded the Ann G. Wylie Dissertation Fellowship, and Eric Frizzell was awarded the National Science Foundation (NSF) Graduate Fellowship. 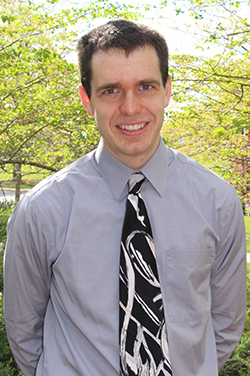 Petro, who is pursuing research on a water-propelled plasma thruster in the Space Power and Propulsion Laboratory under Dr. Ray Sedwick, has been named an ARCS Scholar, a National Science Foundation and Amelia Earhart fellow, and was recognized as one of Aviation Week & Space Technology’s Twenty20s emerging leaders in aerospace in 2016. Petro is also a member of the UMD Clark School Future Faculty Program and was named "Best Teaching Assistant" by the UMD Aerospace Department and AIAA Student Chapter in 2013 and 2014. Prior to pursuing graduate studies at UMD, Petro worked on the MAVEN Mars Orbiter and James Webb Space Telescope missions at NASA’s Goddard Space Flight Center. Nathan Shumway is pursuing research on the unsteady aerodynamics associated with dragonfly flight. The research has two main thrusts: experiments to determine the motion of dragonfly wings in free flight and computational fluid dynamics (CFD) simulations based on these measurements. His research has focused on hypersonic boundary-layer transition and currently he is working on researching the aerodynamic phenomena associated with dragonfly flight. Eric Frizzell works in Dr. Sedwick's Space Power and Propulsion Lab and Center for Orbital Debris Education and Research. His research spans conjunction assessment, space traffic management, and parallel computing. He is passionate about keeping Low Earth Orbit open and usable. Eric is currently conducting research to determine how beacons placed on satellites can improve the estimate of an object's position through time and frequency differencing. His long-term goals include opening the solar system to human exploration and finding solutions in space to meet energy needs on Earth.